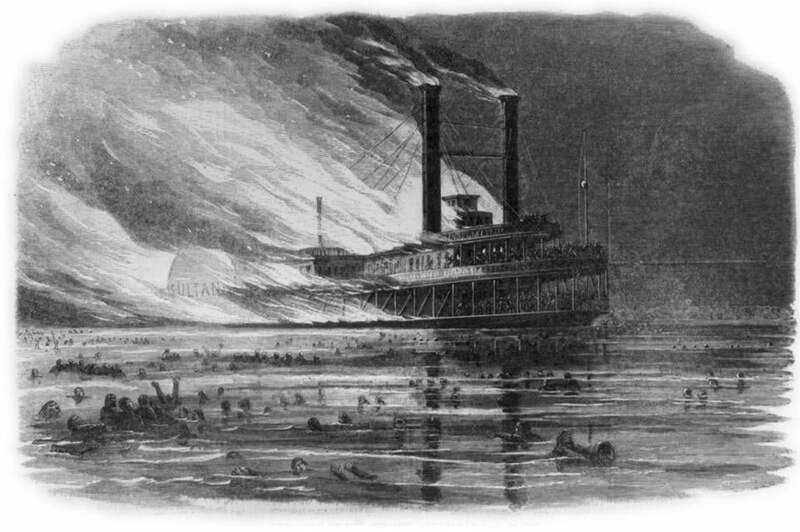 Historians believe more than 1,800 lives were lost when the Sultana exploded and burned on the Mississippi in 1865. The lights of Memphis dissolved into darkness as the ship Sultana paddled against the currents of the Mississippi River shortly after midnight on April 27, 1865. The nearly 2,400 exhausted and emaciated Union soldiers aboard the groaning steamboat — carrying more than six times its licensed capacity — had survived the Civil War’s bloody battlefields and barbarous prisoner-of-war camps such as those at Andersonville and Cahaba. Most, however, would not endure the seemingly routine trip home. Around 2 a.m., three of the overloaded steamboat’s boilers suddenly exploded. The Sultana erupted into a floating inferno. Hundreds died instantly in the blast. Survivors clung to wooden debris and the carcasses of charred horses bobbing in the flood-swollen Mississippi. Those unable to swim — which were most of the passengers — were forced to make split-second decisions between burning or drowning. For days afterward, rescuers plucked bodies from trees near the blast zone and pulled them from the river as far south as Vicksburg, Miss., some 200 miles away. Historians believe that more than 1,800 of the paddle-wheeler’s passengers perished in what still remains the greatest maritime disaster in American history. And as the 150th anniversary of the tragedy arrives, expect to hear the same thing you have heard about the Sultana for the last 150 years — nothing. Unlike the sinking of the Titanic, which claimed 300 fewer lives, the Sultana disaster never spawned any Hollywood blockbusters, theme park-style attractions, souvenir plate collections, or breathless anniversary commemorations. Although they did not perish in battle, the soldiers aboard the Sultana paid for their service with their lives, and that sacrifice deserves to be remembered just as it is at Gettysburg and Antietam. The corrupt quartermaster and captain who overcrowded the steamboat in order to line their pockets also serve as a cautionary tale about the destructive power of greed, but unfortunately the failure to heed the Sultana’s lessons echoes today in the spate of deadly shipwrecks involving crammed vessels carrying migrants across the Mediterranean Sea. What’s more, as the Sultana demonstrates, when we respond to tragedy with the reflexive mantra of “We will never forget,” it’s not always true. So why do some historical figures and episodes become the subjects of weighty historical tomes while others barely garner footnotes? A closer look at the Sultana, Titanic, and some local history reveals eight lessons as to why certain people and events are stuck in our collective memory and others are swept into the dustbin of history. It wouldn’t necessarily be correct to say the Sultana faded from historical memory, because it never resided there in the first place. The initial reports of the disaster garnered just six scant paragraphs in most Boston newspapers and were completely overshadowed by news of the progress of Abraham Lincoln’s funeral train and the end of the manhunt for his assassin, John Wilkes Booth, the day before. “Only a few days ago 1,500 lives were sacrificed to fire and water, almost within sight of the city,” the Memphis Argus wrote less than a fortnight after the tragedy. “Yet, even now, the disaster is scarcely mentioned — some new excitement has taken its place.” The shipwreck’s monstrous loss of life also lacked news value to a public already numbed by the unfathomable body count of the Civil War. The Great Chicago Fire, the most famous conflagration in American history, wasn’t even the deadliest blaze to strike on Oct. 8, 1871. As the Windy City burned, an inferno incinerated the rural lumber town of Peshtigo, Wis., 250 miles to the north. The myth of Mrs. O’Leary’s cow entered the history books but not the Great Peshtigo Fire — although it’s still the deadliest blaze in American history with a death toll 10 times higher than that of Chicago’s. Events outside of major media centers risk being out of sight, out of mind. The rare Revolutionary leader who straddled the political and military spheres, charismatic Joseph Warren delivered stirring orations on the anniversaries of the Boston Massacre, ordered pre-traitorous Benedict Arnold to attack Fort Ticonderoga, and wrote the radical Suffolk Resolves that declared “no obedience is due” Britain’s Intolerable Acts. Warren’s martyrdom at the Battle of Bunker Hill cemented his fame in early American Republic, while patriot Paul Revere was a virtual unknown. “Leading up to the Civil War, Paul Revere was known only to some people who lived in his old neighborhood,” says historian Sam Forman, author of “Dr. Joseph Warren: The Boston Tea Party, Bunker Hill, and the Birth of American Liberty.’’ Then, 40 years after his death, Revere received the PR boost of a lifetime when Henry Wadsworth Longfellow penned his famous — and historically challenged — poem about the Boston silversmith’s midnight ride. Perhaps because he simply had an easier name to rhyme than fellow rider William Dawes, Revere subsequently became familiar to generations of American schoolchildren. Although Warren dispatched Revere on his mission, he was written out of Longfellow’s poem — and out of American memory. Another historical strike against Dawes is that he left behind scant personal records for historians to study, as opposed to Revere, who penned extensive letters, including firsthand accounts of his famous midnight ride. Personal memories can only propel historical legacies for a generation or two. Then, a paper trail is needed for future historians to mine. Contemporary figures who wish to be remembered by posterity may want to think twice about deleting their e-mails. “People destroying records to shape their own legacies may instead find themselves written out of the record entirely,” Forman says. Historic structures, cemeteries, and monuments deliver tangible touchstones to the past. While each year tens of thousands of schoolchildren learn Revere’s story while traipsing through his North End house, don’t expect any field trips to visit City Hall Plaza, the spot where Warren’s house stood until the 1840s. Forman adds that descendants did Warren a further disservice by moving his body from the Old Granary Burying Ground to Forest Hills Cemetery, well off the Freedom Trail’s beaten path. Slapping a name on a public building or transportation facility may be an honor, but it won’t ensure a historical legacy. How many of us really know anything about Edward Logan or William F. Callahan Jr.? Likely fewer than those who mistakenly believe the westbound tunnel is named for Charles, not William, Sumner. “Some forgotten stories cast a negative light on society and for that very reason people want them to be forgotten,” says Andrew Carroll, who toured America’s unmarked historic sites while writing his 2013 book “Here Is Where: Discovering America’s Great Forgotten History.” Among the stories Carroll chronicles is the little-known tale of fugitive slave Ona Judge, who in 1796 escaped to New Hampshire from her well-known owners — George and Martha Washington. Although Judge personified New Hampshire’s “Live Free or Die” motto, Carroll found no marker commemorating her Greenland, N.H., home, in part because her story is a stark reminder of a shameful past connected to an American icon. “That’s just not something we really want to remember,” Carroll heard time and again when digging into uncomfortable stories about the past. Raphael notes that because we crave heroes, grass-roots movements suffer in our historical memory because of their inherent lack of charismatic leaders. And in history’s starring roles, we want people who embody our highest values and ideals, realistic or not. Claudette Colvin was the first African-American arrested for refusing to yield her bus seat in Montgomery, Ala., in 1955, but the NAACP thought the pregnant 15-year-old wasn’t the best image for a test case against the Jim Crow law. Instead they chose Rosa Parks, who became a civil rights icon, while the pioneering Colvin became a footnote. The past is never dead,” William Faulkner wrote. And if that’s true, then resurrection is always possible for forgotten history. “To get a story re-remembered, you need a constituency,” Raphael says. He points to those who have pushed history textbooks in recent years to present fuller portraits of previously underrepresented groups such as African-Americans, Native Americans, and women. Raphael’s 2002 book, “The First American Revolution: Before Lexington and Concord,” has prompted one local constituency to rescue a forgotten episode from its past — the “Worcester Revolution of 1774.” On Sept. 6, 1774, in response to the crown’s suspension of self-rule in the wake of the Boston Tea Party, more than 4,500 militiamen flooded Worcester and forced the British-appointed magistrates to resign. Seven months before Lexington and Concord, Worcester’s patriot rebels effectively rendered themselves independent in a political act that was repeated again and again throughout Massachusetts in 1774. What Raphael has called “the most successful and enduring popular uprising in the nation’s history” was highlighted by early American historians but began to be overshadowed by Lexington and Concord by the time Ralph Waldo Emerson wrote about “the shot heard round the world” in 1837. Raphael’s re-telling of the story resonated with residents and community organizations in Worcester County who last year staged the first-ever reenactment and commemoration of the Worcester Revolution of 1774 and will do so again this fall. “It has mushroomed and become this huge source of local pride,” Raphael says. After being knocked off his pedestal in the Civil War era, Joseph Warren is also experiencing a historical revival after more than a century of obscurity. In addition to Forman’s 2011 biography, Warren prominently featured in Nathaniel Philbrick’s 2013 bestseller, “Bunker Hill.” Pop culture latched onto the dashing doctor earlier this year as one of the main characters in the History Channel’s “Sons of Liberty” miniseries. So perhaps there is some solace for the lost souls of the Sultana. But which constituency will speak for them? Who will honor their memory and fulfill our promise to “never forget”? Christopher Klein is the author of “Strong Boy: The Life and Times of John L. Sullivan, America’s First Sports Hero.” Follow him on Twitter @historyauthor. • Historians: Go big or go home!